This is an 24" x 18" poster featuring the imagery for the That's From Disneyland catalog cover. 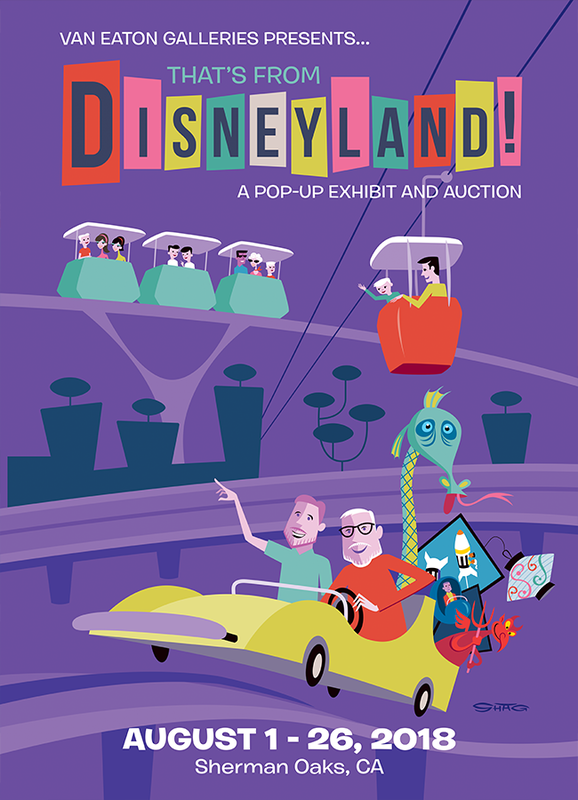 The imagery was designed by Josh Agle (SHAG) himself, and depicts Richard and Nicholas Kraft riding in an Autopia vehicle with great Disneyland collectibles in two. Shag also captured the beloved, extinct attractions The PeopleMover and The Skyway looking over the Krafts' adventure through Tomorrowland. Ships rolled in a sturdy poster tube. This is a standard style poster featuring imagery created for the That's From Disneyland Auction and Exhibition with the full title and exhibition dates present. The poster features a purple tone to the background as compared to the blue tones present on the catalog cover. These posters are not hand-signed by the artist, but feature his printed signature in the lower right hand corner. These posters will begin shipping August 15, 2018. If you have any questions regarding shipping, please ask.